College kids – a naïve bunch of youngsters that run purely on skill, caffeine, and an insatiable hunger to make a mark. It’s been 3 months since I officially graduated — not long enough for me to be overcome by the cynicism that all those preceding me have succumbed to; not long enough for the raw enthusiasm to have been caged by societal rigidity; and certainly not long enough to have gotten over the freedom that college provides. Things clearly didn’t go as per plan. I springboarded off of college and was clearly diving seamlessly into the deep end of the WPR (Work, Party, Repeat) cycle that most of my friends splash around in. However, a ship set sail (wait, wasn’t the previous analogy based on a pool?) to a journey that would be best described with clichéd terms and far-fetched imagery. My first ever job interview. 5 rounds. Cleared them all. Great relief. I don’t know whether it was the skills or sheer luck, but if you are looking for some tips to crack a job interview, there are resources online like these. Dwelled around in nothingness. I wasn’t excited about work, but “life was set”, the procrastinator in me assured me. JOURNEY DAY! I still had another job at hand — I was still going to Pune. I had a train that night, for which I had to pack the night before. And, as fate has it, my body decided to take the stress to another level by falling ill. I somehow completed it and set forth to Pune. It was getting tougher to resist the swank accommodation at the Westin that my MNC firm had provided for us. I finished my final telephonic interview at about 6 in the evening, and that’s when I found out I had gotten the job. Convincing my dad I’m not crazy/hot-blooded/naïve/disrespectful/don’t need a haircut and all the other topics that are raised during a typical conversation with Dad. I bid a sad goodbye to my other friends who did not waver off of the exciting journey that lay ahead for them with the MNC company. I bid a sadder goodbye to the bedroom of dreams at the Westin that I was losing out on. And there I was, a job application for a startup a couple of days before what was supposed to be my first job, and a final interview a day before it – things were clearly happening very quickly. A new place (both the office and the city, I was a newbie in Delhi), new people, and a job I wasn’t mentally prepared for. The skepticism that came with all of this got blown to bits by the enthusiasm the college kid in me had. On the first day, I knew that there was something very different about this work place. It wasn’t the yellow paint or the fact that it was in a basement, was filled with bean bags, and had loud music blaring from the speakers. Maybe a little bit, but it was definitely more than just that. There’s the adage that “A company is nothing without its people” and I guess it couldn’t be more right when it comes to SocialCops. The idea is great, the vision even more fantastic, but the people involved with the startup are what clearly sets this place apart. I finally saw what the “grassroots” that we were all always talking about during our sales pitch was actually like. Sure, there were lush farms and tractors all around. That didn’t amaze me. There were people living in rooms that our double beds wouldn’t fit in. Even that probably didn’t amaze me too much. But that the people who lived in this house wouldn’t let me go without a cup of chai definitely did. That my phone battery died trying to get good network coverage didn’t amaze me. When a guy wouldn’t let me use his phone primarily because I sported a goatee, it did. The fact that there was at least one malnourished child in almost every fourth house wasn’t all too surprising. But the fact that there were people who spent their entire days visiting houses, identifying malnourished children, and helping them till they got better left me in absolute awe. I went on-field with a couple of organizations that were working in the health space (malnourished children and pregnant women, respectively) to see how our data collection platform could make their processes more efficient. It was when I met that woman – the last woman of the day – when it dawned on me the impact these guys had. Turned out she was one day overdue in delivering her child and, without these guys intervening, would have never found out. It is remarkable how people spend a majority of their time helping others lead a better life, and it filled me with pride that our technology could actually help them do their job better. At the end of those 2 weeks, I realized why I’d initially wanted to take this job up, here at a startup against an MNC. Fun colleagues, a good work environment, games of FIFA, and being able to show up at work around 11 (or 12?) are awesome, but definitely secondary; the smile I saw on the face of that mother who found out her son wasn’t malnourished anymore, and the fact that one piece of technology that we can provide can put that smile on a lot more mothers, appealed to me more than anything else. And that’s when I realized that probably the transitioning out from being a college kid is but inevitable, but at least I know that this experience lets me stay one for a little while longer. 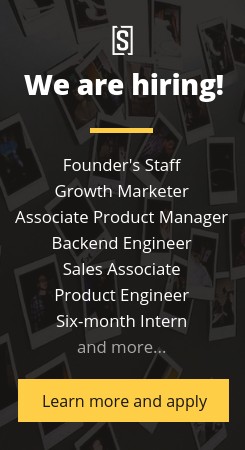 We’re always hiring for our Partnerships team. We believe the road towards our vision is dodgy and the journey is fun only with highly engaged partners. Do you have the patience to listen intently to different kinds of people? Do you have the ability to turn every stone thrown at you into a valuable feedback? Check out our careers page.